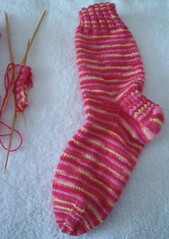 Nicole's Needlework: One sock done! I finished one sock last night while watching the Braves game. Unfortunately they lost. :( Their relief pitching has not been doing to well lately. Oh well, what can you do? Here's a picture of my sock, which is not a loser! And like a good girl I cast on for the 2nd sock right away! In other news... I found the greatest Sony walkman on clearance at Target the other day. It plays the radio of course and it also plays 3 TV stations (abc, fox & nbc). It's so awesome! I think it's the neatest little invention. It's the little things in life that make me happy! :) Well, that's all for now! Write more later! very pretty color! you have to try knitting two socks on two circs. it's great! What yarn is that, I love it!